Holding tight to the mainstay that patience is a virtue, the young musicians behind Santa Barbara’s Ave Caesar have crafted an exquisite 11-track debut that truly necessitates a close listen. Combining dissonant vocals with thoughtful, meandering chord progressions and climactic builds that are as ambient as they are hard-hitting, the four-piece has conceived a sound the likes of which Santa Barbara hasn’t heard of late. Tracks like “Fahren” begin as jazzy, melodic grooves, but climb slowly toward hard-hitting rock-outs. Lead vocalist/guitarist Chris Lynch succeeds in penning lyrics that express raw emotion without overpowering Ave’s collective musical might. 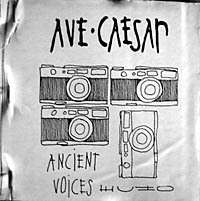 While eloquent piano compositions drive songs like “Distant Laughter” and “The Universal Rehearsal,” prog-y guitar-and-pedal work take center stage on cuts like “The New Industry.” Eerie and melodic, intelligent and aggressive, Ancient Voices Echo promises a bright future for a young bandand a breath of fresh, forward-thinking air for our music scene.